around 250 companies (hatcheries, feed manufacturers, slaughterhouses and processing plants). There are 1.7 million Label Rouge hens in 2013 (about 75% of the national workforce). There are 94.2 million labeled chickens in 2014. It increased by 4% in 2013 and 6% in 2012, with a share of yellow chickens (50%) which continues to rise. Exports account for at least 5% of the national production of Label Rouge poultry. In 2014, direct exports by slaughterhouses increased overall by 1% compared to 2013. 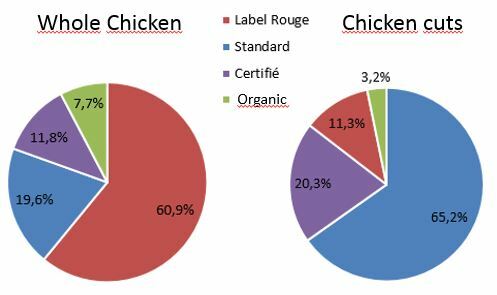 Label Rouge poultry are overwhelmingly exported as whole form (84%), whole chickens alone accounting for 73%. The main importators country are Belgium and Germany, which account together for nearly 54% of the volume exported in 2014. - And “other destinations” (+13%), recipients of 24% of exports, particularly Luxembourg, Scandinavia, Austria, Czech Republic or Spain.